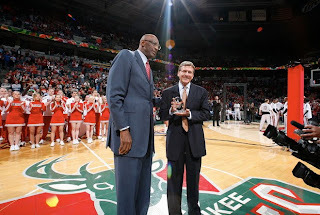 John Hammond Wins an Award ~ The Bucky Channel - The World of Sports from Wisconsin's Perspective. Take that Oklahoma City. You may have got the coach of the year, but John Hammond beat you out for Executive of the Year. Hammond received 12 first place votes, while OKC executive Sam Presti only got nine of them. Hammond really deserves this award with what he did to this team. He made some key trades in the off season. He traded Amir Johnson who we had for like a month for Carlos Delfino. Delfino ended up starting when Redd went down. He took a huge chance in the draft by taking Jennings. I didn't think so, but nine other GM's felt that Jennings was too much of a risk. The Bucks need a point guard so that made it a little easier, out there were still good guards on the board. In the midseason he went out to get John Salmons, who carried this team into the playoffs. He didn't just make one big move, he made many solid moves. He took a team coming off a 34 win season, and made them a team that would win 46 games. They also had injuries that they had to deal with, but he added depth to the bench. The Stackhouse signing was huge to give this team a mentor. He did a good job of starting with the center he had in Andrew Bogut, and putting a playoff team around him. I can't wait to see what he does this offseason to make this team a contender in the East.